In an effort to cover for his own incompetence and malfeasance, Donald Trump has attacked the media. These attacks have been incessant. He has called the media (except for Fox News) the enemy of the people, and told Americans they cannot believe what the media reports. Trump has been pretty effective in convincing his GOP base of that. But most Americans aren't buying into it. They still trust most media outlets more than they trust Trump (40% trustworthy and 60% untrustworthy). 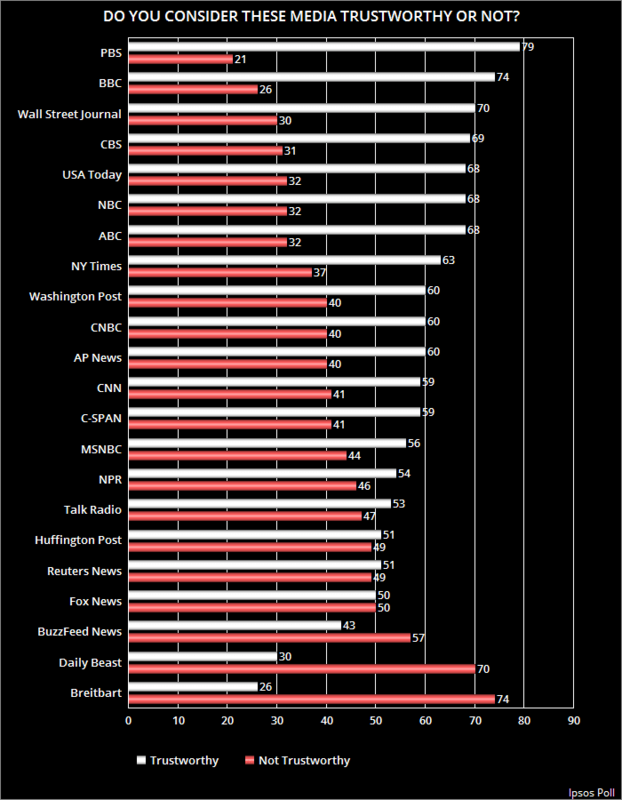 Of the 22 media listed above, only two are trusted less than Trump, while 20 are trusted more. The chart above reflects the results of a new Ipsos Poll -- done between August 3rd and 6th of a national sample of 1,003 adults, with a 3.5 point margin of error.